Added by ana06 (Ana Maria Martinez Gomez) over 1 year ago. Updated 7 months ago. object instead. It is plan to introduce a union! method as well. rb_ary_union_multi. Similaty as done with rb_ary_union. object instead. I plan to introduce a difference! method as well. I'm neutral to your proposal itself. My two cents: Array#union should return a new array instead of modifying self, and Array#union! should be its modifying version. I think it is a great idea. I do not understand why concat modify the array, as most of the method of the Array class has a ! method for that. Should I also introduced a concat! method? Probably changing #concat to be non-destructive is too breaking for backward compatibility. We can use #+ for that purpose. And having #concat and #concat! in the same behavior would be just confusing. What about introducing concat! with the same behaviour as concat and deprecating concat. Then we could in the feature give concat the behaviour it deserves. It is confusing as well that this method modify the object and I think we should fix this. Regarding concat!, there seems to be a misunderstanding that methods should end with ! to be mutating. That is not the convention in the core classes. The core classes have many methods that are mutating but do not end in !. The convention regarding ! is if there is both a method with ! and a method without, the version with ! mutates and the version without returns a potentially modified copy. You'd also probably have to change String and Hash similarly if you wanted this "consistency" in regards to !. In regards to union, not all arrays are sets, and I'm not in favor of introducing additional set-specific methods to Array. Set#union is already implemented. I would that the difference is that there are some method where is not expected that the Array is modified, and some others where you expect it. So, for example, with pop and push I don't think we should have two methods, one which modify the object and another one which does it, but at least I would keep the Array operators methods consistent. jeremyevans0 (Jeremy Evans) do you find it coherent having you union method and only one concat? Won't be that confusing? you will always need to check the documentation as you won't know when the object is modified and when not. Also, union is an operation with Arrays when you when to use then as set for any reason. The main difference is that in the Array the order of the elements matter, so that is unrelated to the Set class. I don't think renaming concat to concat! makes things more coherent. We already have + for a concat that returns a new array. Yes, if you are unfamiliar with the methods you will probably need to read the documentation. The array class already has a union operator (|) which returns a new array, and in combination with replace you can easily build union. union doesn't seem a common enough need to warrant adding as a separate core method. Yes, a operator that is not clear for many people. I think Ruby deserve something more readable and elegant. Moreover, union would allow to make the union of more than 2 arrays at the same time in a much more efficient way than applying | several times. So it is not only an "stetic" change, it is also a performance improvement. Yes, a operator that is not clear for many people. I think Ruby deserve something more readable and elegant. The argument against the | operator could potentially apply to any operator. Most things are unclear until they are learned. Someone with no knowledge of English might find the | operator more clear than the union method. Moreover, union would allow to make the union of more than 2 arrays at the same time in a much more efficient way than applying | several times. So it is not only an "stetic" change, it is also a performance improvement. You could build union without a nested application of |. No doubt you could get the maximum performance by implementing it in C, but I don't believe the cost of maintaining such code is worth it, considering how often it is used. What I want is to provide an efficient union of several arrays, that need to be implemented in C. Implementing this in a Ruby gem makes no point at all. I care because once it is added, it is impossible to remove without breaking backwards compatibility. This is not a one time cost of initial implementation, it's a perpetual maintenance cost. I'm not in favor of adding methods to the core classes simply because they are useful in certain cases. If we added every method to the core classes that was useful in specific cases, we'd eventually have thousands of methods in each core class. It appears you may not be aware that plenty of ruby gems are implemented in C using ruby's C-API and have same performance as if they were part of ruby core. I am not sure your real intention. Do you want mutating variation of or-operator? Or just more readable alias of or-operator? I would definitely prefer Yusuke's version to a version where Array#union is not modifying. While the modifying version will occasionally be useful, in general, we should gently push people towards using non-modifying code. Thanks for taking a look at the issue. What I am proposing is a new union method that it is an alias for | in the case of two arrays but that it is also more efficient in the case of more than two arrays. Exactly as it happens with + and concat. concat, apart from modifying the first array (which maybe shouldn't be the case) is more readable, but in the case on more than two arrays is more efficient as well. I cannot say that I am a fan of this proposal. To be fair, I'm not a fan of #|. Arrays are not sets. Trying to treat them as if they are is an error, and will create subtle problems. What should be the result of the following operations? Of course, there are more interesting examples. These two are to get you started. I don't care what the results currently are. I don't care what you think they should be. I can present extremely strong arguments for various answers. For this reason, I believe that #| is an ill-defined concept. Generalizing an ill-defined concept is a world of pain. If you insist on treating objects of one class as if they were members of a different class, there should be bumps in the road to at least warn you that maybe this is a bad idea. I'm not going to argue that we should remove or deprecate #|. I don't think of myself as a fanatic. But encouraging this sort of abuse of the type system just creates problems. 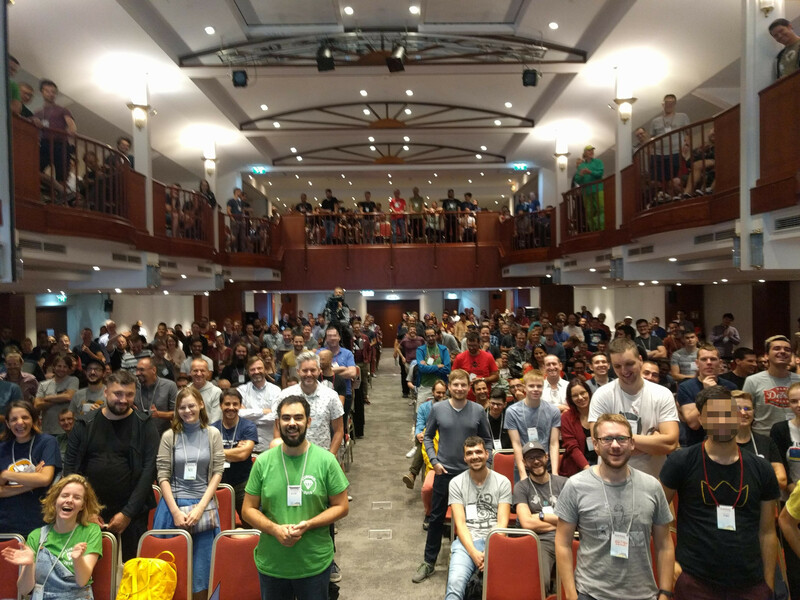 Ana, I watched the video of your EuRuKo talk. I could understand the background of your proposal. However, I'm now getting confused. I thought you agreed that Array#union should be non-destructive, but in your talk you explained it was a destructive union operator. What are you driving at? Thank you for the answer. I'm assigning this ticket to matz. I think there are some uses of case. First, it could be that you have an array in your application, would it be worthwhile to convert it to set just to be able to do a union? Second, what happen if you want to add the elements of an array to another array only if they were not already there but keeping the order? you can not do this with a set. Third, what if after the union you want to apply a method in the Array class that is not in the Set class (like for example sort_by)? The quality of the picture is not really good, but I have pixelized the faces of the recognizable people wearing a red cord (as they don't want to appear on pictures). I hope is fine. There are more picture from the conference organization in better quality, which I will add as soon as they send them to me. I'm now for the addition. By the way, don't you need Array#intersection? The final proposal seems reasonable. Accepted. I have just rebased in the PR, looking forward to see the Array#union method in Ruby!